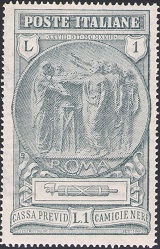 The first charity stamps of Italy were issued in 1915. These types of stamps feature a "value added amount" or "surtax amount" in addition to the postal denomination of the stamp. Italy, as well as most other countries of the world, utilizes the added amounts on these surtaxed postage stamps to raise money for national organizations, public events, and public charities. The issue of Italian stamps, to raise money for charitable purposes, began out of necessity. All of the stamps on this page were either issued during or just after World War I. Where the French and British armies were fighting in Western Europe against the armed forces of the German Empire, the Italian army was fighting against the equally powerful armed forces of the Austro-Hungarian Empire, creating large numbers of badly wounded soldiers and needy civilians. As a result, the need arose to quickly raise money to fund public charities for the aid of Italian war victims and their families. One of the easiest ways to accomplish this was to levy a surtax or value added tax on letter mail. The four stamps shown above (Sc. #B1-4) were issued between 1915 and 1916 to raise money for the Red Cross. The designs feature an eagle displaying the Arms of Savoy. 10 C. + 5 C. (1915 - Sc. #B1) - Rose. 20 C. + 5 C. (1916 - Sc. #B3) - Orange. B.L.P. 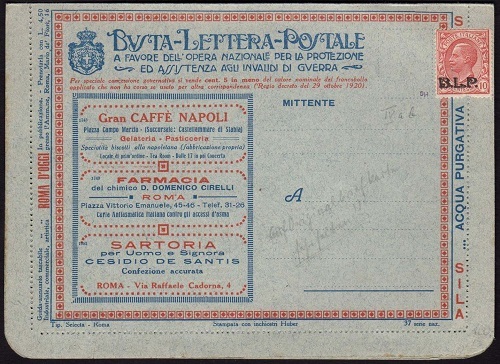 is the abbreviation for Buste Lettere Postali or Letter Mail Envelopes. An entire section of the Sassone specialized catalog is devoted to this particular subject. The overprinted stamps were sold by the Italian postal service to the National Federation for Assisting War Invalids at below face value. They were affixed to special envelopes, what we would call letter sheets in U.S. philately, that bore paid advertisements. The federation was permitted to sell these envelopes at a reduction of 5 C. from the face value of each of the stamps. The profits used to support the war invalids were derived from the paid advertisements printed on the envelopes. There are MANY different types of these envelopes, differing in color, in appearance, and in the type of paid advertisements printed on them. There were three different types of overprints used for the following stamps. Type I - The letters are tall and narrow. The overprint is 11 mm wide. Type II - The letters are wider and shorter. The overprint is 13 1/2 mm wide. Type I was only used for the 1921 issues. Types II and III were only used for the 1922-1923 issues. 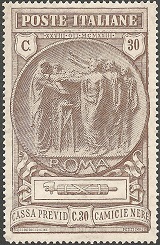 The four overprinted stamps of Italy shown above were issued during 1921. They all have the Type I overprint. 10 C. (1921 - Type I - Sc. #B5) - Claret with blue overprint. 20 C. (1921 - Type I - Sc. #B6) - Brown Orange with blue overprint. 25 C. (1921 - Type I - Sc. #B7) - Blue with red overprint. 40 C. (1921 - Type I - Sc. #B8) - Brown with blue overprint or violet overprint. The ten overprinted stamps of Italy shown above were issued during 1922 and 1923. They all have the Type II or Type III overprints. 10 C. (1923 - Type II/III - Sc. #B9) - Claret with blue overprint or brown overprint. 15 C. (1922 - Type II/III - Sc. #B10) - Slate with orange overprint, blue overprint, or red overprint. 20 C. (1922 - Type II/III - Sc. #B11) - Brown Orange with black overprint or blue overprint. 25 C. (1923 - Type II/III - Sc. #B12) - Blue with black overprint, red overprint, or orange overprint. 30 C. (1922 - Type III - Sc. #B12A) - Orange Brown with black overprint. 40 C. (1922 - Type II - Sc. #B13) - Brown with blue overprint or black overprint. 50 C. (1923 - Type II - Sc. #B14) - Violet with black overprint or blue overprint. 60 C. (1922 - Type II - Sc. #B15) - Carmine with black overprint. 85 C. (1922 - Type III - Sc. #B15A) - Chocolate with black overprint. 1 L. (1923 - Type II - Sc. #B16) - Brown and Green with black overprint. Most of these overprinted stamps of Italy also exist with misplaced overprints, missing overprints (in pairs), double overprints, and inverted overprints. See the Sassone specialized catalog for details. The B.L.P. overprints were also applied to three commemorative postage stamp sets of 1922. They are the Dante set, the Victory on the Piave set, and the Mazzini set. The Dante set is shown above. These were not regularly issued and authenticated, mint condition examples of them are very rare. 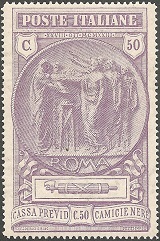 The three stamps of Italy shown above (Sc. #B17-19) were issued on October 29, 1923 to commemorate the 1st Anniversary of the Establishment of the Fascist Government. The central vignette features the Administering of the Fascist Oath, stylized to appear as an Ancient Roman Sestertius coin. No Roman Sestertii were actually ever minted with this reverse type. The surtax benefited the Fund of the Black Shirts, later called the National Militia.